Related: The Fermi Paradox: Where the Hell are the Other Earths? An oft-cited solution to the Fermi Paradox — that is, the lack of observational evidence that our galaxy has been colonised by an extraterrestrial civilisation — is the Great Filter hypothesis. Devised by Robin Hanson of George Mason University, this theory suggests that some kind of cosmic-wide obstacle is preventing life from developing beyond a certain stage. Trouble is, we’re not entirely sure if this Great Filter actually exists, or what it looks like. Some astrobiologists look to our planet’s ancient past and point to the presence of three possible filter points: the emergence of reproductive molecules, simple single-celled life, or complex single-celled life. If we could prove that any one of these critical evolutionary steps are true, that would be exceptionally good news — it would imply that the Great Filter is behind us. On the other hand, some pessimistic futurists fear that the Great Filter looms ahead of us, an event that will likely come in the form of a self-inflicted existential catastrophe. But as a new paper by Australian National University astrobiologists Aditya Chopra and Charley Lineweaver points out, there may be another possibility. They say that life exists for a brief time on other planets, but it goes extinct very quickly. The researchers are calling it the “Gaian Bottleneck Hypothesis”. As Chopra put it in a press release, “Early life is fragile, so we believe it rarely evolves quickly enough to survive.” The problem, he said, is that most early planetary environments are unstable. In order to sustain life, a planet needs to regulate greenhouse gases to keep surface temperatures stable. This process, called Gaian regulation, happened on our planet. But Chopra and Lineweaver speculate that it’s a rare occurrence. If life emerges on a planet, it only rarely evolves quickly enough to regulate greenhouse gases and albedo, thereby maintaining surface temperatures compatible with liquid water and habitability. 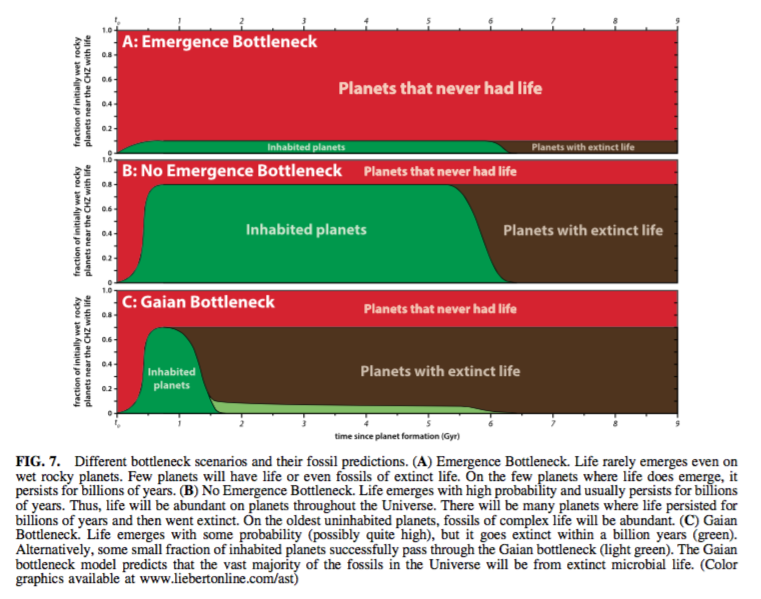 The presence of a Gaian bottleneck, therefore, suggests that extinction is the “cosmic default” for more life that emerges on the surfaces of wet rocky planets in the Universe, and that rocky planets “need to be inhabited to remain habitable”. Credit: Chopra & Lineweaver, 2016/Astrobiology. “The mystery of why we haven’t yet found signs of aliens may have less to do with the likelihood of the origin of life or intelligence and have more to do with the rarity of the rapid emergence of biological regulation of feedback cycles on planetary surfaces,” said Lineweaver. It’s an intriguing theory, but in order for it to satisfy the demands of the Great Filter hypothesis, it needs to be sweepingly universal in scope. It’s not immediately clear from the Chopra and Lineweaver paper why Gaian regulation should be so rare on other habitable worlds, or how infrequent this process actually is. Given that there are likely tens of billions of potentially habitable planets in our galaxy, and given that our galaxy has been able to sustain life for about 5-6 billion years, it would have to be one hell of a bottleneck. The basic idea is quite plausible as a part of the Great Filter. But the Great Filter is enormous, and this paper offers no concrete arguments for why we should expect their filter effect to be enormous. So we can add it to our long list of plausible filter effects, but we don’t have a good reason to see it as THE one thing that causes most of the great filter. That said, this possible solution to the Fermi Paradox may actually be testable.